It cannot be a coincidence. The odds would be too great. I need another 70 shards and he has appeared 2x in the past 3 weeks - I check every refresh. My guildmates who are also farming him are claiming the same drop rates, around 1x/week. Apparently no one can ever win the lottery or be struck by lightning. The odds of those happening are much lower than you getting Logray twice every 3 weeks. And yet...given a large enough sample size, these incredibly low-odd occurrences do happen. There could be a player who has never had Logray appear in his store. No, actually, it doesn't. There's a burden of proof that only rests on one person, and it's the side that's making the extraordinary claim. Like, we can see drop rates if we track them long enough with enough of a sample size and we can see that they're consistently the same whether there's an event going on or not. If you're going to say that it's anything other than what's been established the burden of proof is on you to prove your claim, not on us to disprove yours or prove ours. Great...Okay, so let’s get what 1,000(?) maybe 10,000(?) people to count occurrences in that slot for what, a week? a month? Without missing a refresh...and then still get someone (maybe you?) saying it’s not statistally significant enough for proof or pointing out that some people might be making some of their numbers up to help prove the point. Yes, that’s going to work really well isn’t it?! I’ll get right on that! CG were transparent about pack probabilities and so a simple statement from them saying there is no occurrence weighting mechanism might just be quicker and easier. There's a legal reason they did the pack odds. Just because you don't like what it would take to get a relevant sample size does not mean you can just ignore the need for it. There is indeed a legal reason behind pack probabilities. And the reason is simple: Google does not admit RNG-based microtransactions without disclosing the probabilities and in light of this, every refund request they got about crystals in swgoh was accepted, because swgoh didn't respect Google's rules. There were people that knew this fact and exploited it by buying a lot of crystals, requesting refunds shortly after and practically getting lots of crystals for free. This is also why they didn't (and still don't) like when people speak about refunds in this forum, because knowing about it easily leads to the buy-refund exploit. Hope you read this before they delete it and warn me for whatever reason they use when they don't like the truth. Yeah. True for every shop imo. Farm exclusive shards first. When finished, buy something else. If it's a fair RNG you would have the same odds of getting 28/28 drops per week out of logray as 0/28. I'm not complaining about the scarcity, i'm just stating it's scarce and i don't like it being an important part of the legendary because of it. Sure, wicket might be more useful, but that isn't going to happen quickly either. I'm not going to ever believe they don't make some things hard to acquire (whether through rarer drops or lower odds on HM's, etc) because i've seen toons that are a royal %$#& to farm and others that simply aren't on the same level. I've flat given up on getting Sabine to 7 (or 6 for that matter). I don't believe its pure un-altered RNG. I repeatedly get 1 or 0 whereas on others i'll hit 5 or 6 (not often, but still) doing 8 HM's. I think the best i ever got off sabine was a 3 and that was maybe once. Be nice to get her up for ships, but whatever. I'm not complaining just saying my experience does not lead me to believe it's a straight RNG is all. Just like I don't think Logray is or a few others that randomly pop into shops. I don't really see how the shop rarity gets them money or enhances a **** thing either. Logray is only a problem if you haven’t farmed him from the first day he was added to guild shipments. If that is the case...then the real problem is the choice players made to farm gear or other shards rather than lograys shards. You can’t blame ea for that only yourselves. I had logray shards farmed since day 1 of him being added. When the event came all I had to do was farm gear. My motto: Farm everything now and gear them later. Do this and you’ll never miss out on an event again. Unless it’s an event like Revans where you don’t get a full 2 weeks to farm a full faction squad before the event goes live. In that case you’re forced to spend money(like I had to do), or maybe you’re forced to spend your hoarded crystals stash(like people I know did)...or even worse you’re forced to miss out on the event all together(like a huge percentage of the community did). Either way: Farm everything the day it becomes farmable and gear later is something that helps when trying to keep up and stay ahead when progressing your roster. I couldn't tell you when he was added to the shop to be honest. This is my 13th month of playing. The first few months ewoks weren't on the radar really. I was considering them, then they did the rework of mods and ships and they became much less important so there was never a need to start. Then they add a Legendary requiring them and you had 2-3 weeks advance notice. There's no shortage of things to farm for, i mean they're at what? 10 legendaries now? More? Personally, not a big fan of adding like 4 in 4 months. Simply too much if you weren't around from the get go or aren't throwing around gobs of cash. In august/september i just go around to FO for BB8 and was about to start on JTR and then, Revan, Chewy, 3po, and **** in successive months. unless you already had all of them (and you couldn't really for revan) you had to farm and there's no way to farm all that in that timeframe without spending like a drunken sailor. If you'd been around 2-3 years or so, yeah, most were possible. 9 months or less? no. People playing 2-3 years should have it easier than those playing 9 months or less. Do your time, and you’ll be able to say the same thing. New players aren’t meant to unlock all the legendaries in the first year. I'm not hard farming ewoks atm, but I'm just picking Logray up when and if I see him, so that when I knuckle down on it, i'm a fair way through the hard bit. a shipment a week is hardly crippling my more current farms. **** RNG, some people are lucky and enjoy the game, some dont and get frustrated. I dont call that a good gameplay. You add the insane powercreep/paywall politics that is now driving CG and my 10 years old nephew became a better game designer than them. Look at the ship arena, there is now 48 falcons in the top50, this is really pathetic. No balance anywhere. New players aren’t meant to unlock all the legendaries in the first year. It just takes focus. I started in the middle of last May. I didn't 7* C-3P0 and the Falcon first time around, but I'll be ready before they come back. I'll get JTR in a few days, and I should be ready for the new Old Republic legendary. This post tells the story. Players need to focus on farming char/ship shards when they're available and plentiful. Those chars/ships may not appear valuable to begin with but new characters and reworks can suddenly make them become valuable. Once you have the char/ship at 7*, you don't need to worry about obtaining shards for it again and it can be warehoused until if/when it becomes necessary. It can always be geared later. Gear doesn't disappear, but char/ship shards can become rarer to obtain. Use energy to farm shards. Use tokens in shops to get gear. The problem is what to farm. I've been playing just over a year. I still need DT to help my guild. Thankfully I've got a core of BH including Dengar and Bossk and my NS are in decent shape but could use a little more gear and 2 more zetas. I also have Bastila CLS and JTR and their teams. I need BH ships. Working like crazy on them (and of course they are way below 33% drop rate for me) I need Sith ships for whatever is next. Sith pilots too (non-existant drop rates). I need new OR for whatever is next. I still need to finish Sion and Nihilus. 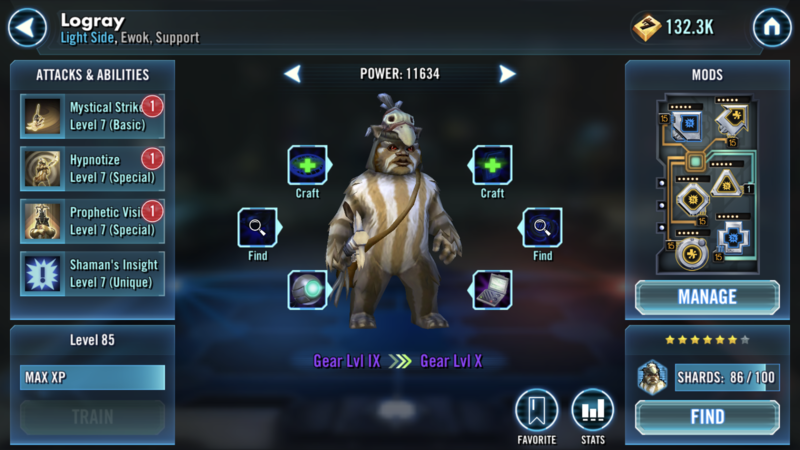 I need Ewoks for next time around on C3PO (for now just farming Paploo and Logray in guild shop and trying to work on CC and Wicket in respective nodes. CC drop rate is horrendous. I'd stop if he wasn't pretty much required. Like I'm at 16.6% there. 1 drop per 6 sims over several weeks. I'm just finishing Z and just using fleet for him right now. 6 shards in the last 4 days. Hey, speaking of which. does anyone have some dirt they can share on RNG? I need some leverage here! Anyway, you need tunnel vision in this game. If you get distracted you'll never recover. If you get too far out of the meta your arena rank drops and then you lose out on crystals. That makes it even worse to try to get back in since you can't afford the refreshes. I suspect that's the point you quit too. The sad thing is I had a serious hunch we needed Ewoks about 3-4 months ago and told my guild to get them. Then I got distracted by OR and missed 3PO. At least I'll get Revan when they actually bring him back. I still think they should have brought him back 3 weeks ago for a 2nd payday from everyone that didn't want to wait another 3 months. The only 'dirt' I can give you regarding RNG is that the drop rate for shards averages to about 33%. This could all be solved if they simply posted the percentage likelihood of him appearing. I am in the same boat. Dengar and Jyn were so annoying to farm that I did not bother with Logray... Instead I'll go with the ones I have: zChirpa, zPaploo, Teebo, Elder and Scout. All of them already G12 with PVP mods. If that does not suffice, I'll go for Wicket instead as easier to farm (monthly event + hard node) and better toon in my opinion (keeps elder invisible and increases damage output). How is this terrible thread not closed? Yes. Why there is a logray problem btw? 1) of course he doesn't show up. They have to force you to spend on the ewoks pack somehow, and there is not better way to force you to spend on it than forcing you to do it just for one character. 2) you have to expect whales and addicted people making comments like "this thread is useless" and "your problem" when you make such threads. They aren't obviously able to understand the struggle, as they either just buy what they're missing or mock you because they just eat everything CG throws at them since the first day. Obviously it’s not that terrible since many see the same issue 😉. I have a 7* logray, so it is possible for a F2P gamer to get him. The problem I am running into is I don't have wicket at 7*, but that is my fault for not investing in ewoks sooner to complete atst takedown for several months. I am working towards a 6*, I need 15 or so shards..